The new Dodge Ram Power Wagon has been updated to be rougher and tougher than its 2013 predecessor. When it comes to creating trucks to get the job done in any circumstance, Dodge trucks know no equal. The first impression left by the 2014 Power Wagon is just as striking as its predecessors. 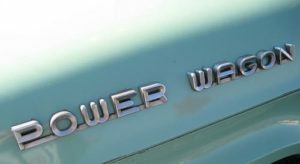 The body lines and curves remain almost unchanged, and the iconic “Power Wagon” decals continue to leave a forceful first impression. However, looks can be deceiving. Under the hood and under the truck, the 2014 Power Wagons have been made even better for their rough and tumble off-road mission. Huge 32-inch BF Goodrich All-Terrain T/A KO tires come standard for maximum traction on and off the road. 14.5 inch ground clearance, a maximum approach angle of 34 degrees, and a maximum departure angle of 23.5 degrees get you up, over and down some of the most extreme terrain shifts while still clearing the front bumper. Sway bar has an electronic disconnection feature, enhancing suspension on the most uneven terrain. Completely redesigned ladder frame made of rugged 50 KSI steel. New five-link rear axles keep the Power Wagon handling smoothly even in the toughest terrains. Locking front and rear differentials keep traction at peak performance in all terrains. A 12,000 pound winch comes standard with the Power Wagon for pulling lesser vehicles out of ruts and ditches. Skid plates on the underside of the vehicle protect important parts from damage when the truck bottoms out. While the 2014 Dodge Ram Power Wagon is clearly made for off-road performance, it does not sacrifice comfort in the process. 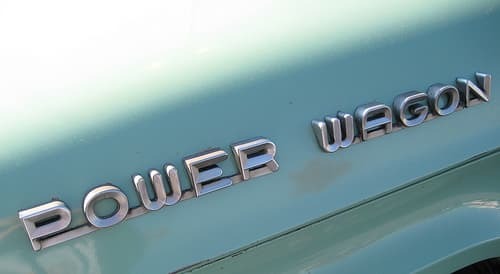 With upgraded materials from last year, a redesigned HVAC system, redesigned multimedia controls, a Uconnect infotainment system, and a 3.5 or 7 inch information screen on the dashboard, the 2014 Power Wagon is the perfect pairing of off-road prowess and luxury comfort. When it comes to navigating mud and crawling through the rockiest terrain, the 2014 Dodge Ram Power Wagon is peerless. No pickup truck off-roads like the Power Wagon does, and it does it all with attitude and style.